Doctor Who’s biggest moment in history was celebrated around the world this weekend as Doctor Who’s 50th Anniversary episode, The Day of the Doctor , was watched by 10.6 Million viewers on BBC One, simulcast in 94 countries around the world and shown in over 1500 cinemas. The Doctors embarked on their greatest adventure in the 50th anniversary 75 minute special episode, starring Matt Smith, David Tennant and Jenna Coleman with Billie Piper, John Hurt, a surprise appearance from Tom Baker and a glance of the new Doctor Peter Capaldi. Along with a BBC One peak audience of 10.6M and average 10.2million (37.4% share) on Saturday night, The Day of the Doctor was simulcast in 94 countries including UK, US, Canada, Germany, Norway, Denmark, Russia, Brazil, Argentina, Mexico, Colombia, Chile, Panama, Peru. 834 cinemas around the world also screened the episode live at 7.50PM with 1559 in total showing the Anniversary episode. Ben Stephenson, Controller BBC Drama adds: “What a triumph! I couldn't be prouder of Steven, Faith and the team for pulling together such a blinder of an episode. Not only a great celebration of a great show, it also perfectly showcased why the BBC remains such a great and important institution." BBC Three followed the episode with Doctor Who Live: The Afterparty, hosted by Zoe Ball and Rick Edwards, which drew 1.3 million viewers as Matt Smith and guests discussed the Doctor’s most epic adventure yet. The success of the celebrations also included BBC Two’s An Adventure in Space and Time, a special one-off drama by Mark Gatiss that travels back in time to 1963 to see how Doctor Who was first brought to the screen, which gained an average audience of 2.2M viewers and 9.7% share on Thursday night. Also on BBC Two Professor Brian Cox explored the universe of the world’s favourite Time Lord in The Science of Doctor Who, with 2.6 million viewers (12.1% share), plus an hour-long special of BBC Two’s flagship arts programme The Culture Show presented Me, You And Doctor Who. BBC Three content also included a Monsters And Villains Weekend, Doctor Who: The Ultimate Guide Who and there was also programming across CBBC with 12 Again, two Blue Peter specials, and a Blue Peter competition giving viewers aged between six and 14 the opportunity to design a new gadget that will become part of the iconic series. The exclusive Doctor Who mini episode, The Night of the Doctor, for BBC iPlayer had over one million requests on iPlayer in its first three days – the top performing programme on iPlayer during this period. In total, Doctor Who programmes have been requested on BBC iPlayer more than 100 million times over BBC iPlayer’s history and is one of the most successful programme brands on iPlayer. Doctor Who also features in the top ten most-requested individual episodes on BBC iPlayer of all time (Series 5, episode 1, The Eleventh Hour, with nearly three million requests). It’s not just TV where audiences joined in the celebrations; programming across Radio 2, Radio 1 and Radio 4 Extra also marked the 50th. Google even joined in the celebrations with its most ambitious doodles - a special game to celebrate the 50th Anniversary for 24 hours globally. 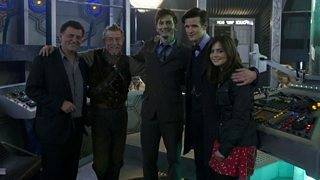 The Day of the Doctor was written by Steven Moffat and directed by Nick Hurran. Executive produced by Steven Moffat, Head of Drama BBC Cymru Wales, Faith Penhale and Brian Minchin.